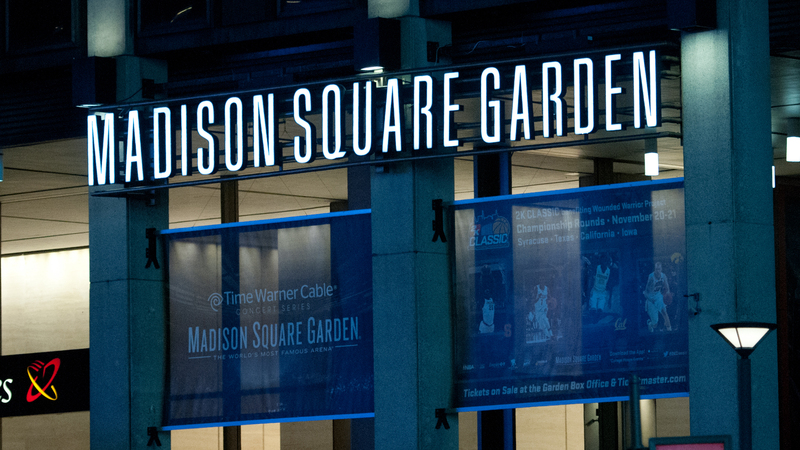 The Week in Wrestling: Did WWE Really Try to Block ROH’s Date at Madison Square Garden? Ring of Honor’s CEO said the company delayed its MSG announcement due to WWE’s intervention. Ring of Honor and New Japan Pro Wrestling are coming to Madison Square Garden. The joint show, the G1 Supercard, is set to run directly against WWE’s NXT TakeOver: Brooklyn on April 6, 2019, the night before WrestleMania 35 at MetLife Stadium in New Jersey. Although the date is official, some questions regarding the show remain unanswered. Most notably, did WWE try to block Ring of Honor from running a show at Madison Square Garden? The original news that Ring of Honor was looking to book the Garden broke earlier than expected, when ROH-parent company Sinclair Broadcast Group CEO Chris Ripley revealed in a June 12 interview with The Baltimore Business Journal that ROH would be holding a show at the Garden in 2019. Despite the early revelation, Ring of Honor had already locked in New Japan talent by the end of March for the MSG show. ROH was ready to formally announce the G1 Supercard after the interview ran in The Baltimore Business Journal, but could not do so, Koff stated, due to WWE’s interference. If WWE did not block ROH, then why was the initial announcement of their historic G1 Supercard at Madison Square Garden postponed? This is where the story becomes complex. Koff is a very honest and intelligent businessman, and there is zero chance he would ever indict WWE without cause. Sports Illustrated can confirm that the WWE was not happy they were blamed for having anything to do with ROH’s pursuit of Madison Square Garden, and multiple industry sources also verified that MSG officials found WWE very cooperative during the entire process. But a key question lingers: why was WWE involved in a deal between ROH and MSG? In the end, all parties cooperated, which is best for wrestling fans. Legally, WWE would not be able to block ROH from securing a date at MSG, even if the industry giant may have been annoyed that another promotion stole some of its sizzle during the single biggest wrestling weekend of the year. WWE’s job is to protect its turf, while ROH’s objective is to expand its own. Ultimately, this was not personal. It was business, on every side, from WWE to MSG to ROH. The timing is serendipitous for ROH and NJPW, with 80,000 wrestling fans in town for WrestleMania that weekend. Even with NXT running on April 6 in Brooklyn, there will be more than enough wrestling fans to fill the Garden and generate a successful house for the ROH/NJPW show. The timing is also maddening for WWE, as its NXT TakeOver now has to compete directly against the ROH/NJPW show, which is bound to generate a considerable amount of buzz by making history at the Garden. Whether there is any animosity between WWE and Ring of Honor is unknown. Both companies are too smart to engage in name-calling, insults, or any type of public behavior that would not positively represent their brand. What also remains unknown is whether this MSG date has consequences for ROH. WWE rarely tastes defeat in public dealings, but it is not as though it will go on a spending spree to sign away all of ROH’s talent or become more aggressive with New Japan’s roster. WWE already pursues talent from across the world, and it would be interested in stars like Kenny Omega and the Young Bucks regardless of whether the MSG booking ever took place for ROH. The possibility exists for some massive contracts to be signed with impending free agents in January of 2019 by either WWE or ROH as the battle between the two promotions escalates. Flip Gordon is in the midst of a six-month odyssey to be booked at the upcoming All In supershow in September, and he is now presented with a golden opportunity: a match with NWA world’s heavyweight champion Nick Aldis. If Gordon defeats Aldis, he will then defend his newly-won championship at All In against Cody Rhodes. The NWA title match takes place on Friday at the Nashville Municipal Auditorium and will be aired on ROH’s streaming service HonorClub. The story of Rhodes continually giving Gordon a hard time has served as a staple on “Being The Elite”, with Rhodes providing different opportunities for Gordon to be booked at All In but failing to capitalize. Gordon also spoke highly of Aldis, who defeated Tim Storm in December for the NWA championship, which has lineage that dates back to 1948. “It’s such an honor to compete for the NWA world’s heavyweight championship,” said Gordon. “Look at the legends that held that title. The opportunity is right here in front of me, and I’m very excited, but I can’t get too excited—I haven’t won the match yet. It is going to be a tough match, it’s going to be a great match and a fun match, and it can skyrocket my career or keep me from All In. Gordon’s style is unique. Although there are many high-flyers in wrestling, there is only one Flip Gordon. Gordon’s psychology is on display in his flips, using the maneuver to escape opponent’s holds and he even delivered a back flip with someone on his shoulders. Versatility is critical to Gordon’s success. He worked New Japan’s Best of the Super Juniors this year, the King of the Indies tournament in California, and even wrestled WWE Hall of Famer Bully Ray at Ring of Honor’s most recent pay per view. Gordon has a tremendous upside and already generates a legitimate buzz, and he now has the chance to redefine the look and style of an NWA world champ. • This week’s Raw featured two entertaining triple-threat matches to help decide the number one contender for Brock Lesnar’s Universal Championship. Despite their predictability—Roman Reigns and Bobby Lashley were the winners—both matches contained enough suspense to make you think that it was possible that someone other than Reigns or Lashley would win, with Finn Balor’s Coup de Grace on Reigns serving as a perfect example. The placement of the two triple-threats was telling: Lashley was in the main event, which is territory normally reserved for Reigns. Very quietly, Reigns starred in an incredibly compelling match. His triple-threat with Balor and Drew McIntyre lasted over 20 minutes and was a spectacular reminder that WWE employs some of the greatest wrestlers in the world. The match allowed McIntyre to dominate early and showcase his skillset, especially against Reigns, which makes you think that they will be placed in a program together if Reigns wins the title from Lesnar. Considering that Lesnar has not had a singles match since April, as well as the fact that we have already seen too much of Lesnar vs. Reigns in one-on-one competition, the most likely choice for the SummerSlam main event is Lesnar defending his title in a triple-threat against Lashley and Reigns. • In addition to Tom Phillips and Corey Graves using the word “tranquilo,” which is most often used by New Japan’s Tetsuya Naito, the highlight of SmackDown Live was the opening match between AJ Styles and Andrade Cien Almas and the story behind it. The backstory on “tranquilo” is that both Almas and Naito were part of Los Ingobernables in the Mexico-based CMLL promotion. Almas is actually a founding member of Los Ingobernables, while Naito remains the leader of Los Ingobernables de Japon. Styles now has history with both Almas and Naito, defeating Almas in a brilliant opening match on SmackDown as well as beating Naito at New Japan’s Wrestle Kingdom 9 at the Tokyo Dome in 2015. • XWA’s “Wrestlution ’18” took place this past Sunday in West Warwick, Rhode Island, and a highlight of the show was the triple-threat match between Matt Sydal, AR Fox, and Flip Gordon. The match will soon be available on the newly-launched XWA Network, and features an incredible display of athleticism from three extremely talented workers. Sydal worked for years in WWE as Evan Bourne, first debuting in 2008 at only 25 years old on the WWE-run ECW brand and had a tag team title run with Kofi Kingston in 2011. He has also worked for New Japan, Ring of Honor, EVOLVE, Dragon Gate, PWG, and is currently wrestling for Impact. He discussed planning out the triple-threat match, which was designed to give an entertaining story to those watching. The match was originally supposed to be a triple-threat with Sydal, Fox, and Lucha Underground’s Rey Fenix, but Fenix had to back out due to injury and was replaced by Gordon. “The reaction that Flip got when he was introduced was so much more than I thought it would be, so it made sense to run with that and give the crowd more Flip,” said Sydal, allowing people a look into how the match was laid out in the ring. “He has endless offense, so we let him run it. Then, when he was running too fast, then it was my opportunity. Sydal wrestles “The Machine” Brian Cage this Sunday at Impact’s Slammiversary, and the same type of execution and thought that was visible in his XWA match will again be on display at Impact’s per pay view. Fox is best known for his work in Lucha Underground as Dante Fox, but he is also a staple of EVOLVE and the independent scene across the country. The finish of the match saw Sydal use his new finisher, Chemical Imbalance, which is a double-pump handle on an opponent bent over leading to an invert front-flip ending in a cradle. The XWA show closed with a main event between Rob Vam Dam and John Morrison, which held significant meaning for Sydal. • New Japan Pro Wrestling’s 28th annual G1 Climax is underway. The round-robin style tournament runs until August 12, and the winner of the 20-man field is decided when the wrestler with the most points from Block A squares off against the wrestler with the most points from Block B. Points are awarded by winning a match, which counts for two points, a draw (all matches have a 30-minute time limit) is worth one point, and a loss accrues no points. Memorable moments over the first three nights of the G1 started with “Switchblade” Jay White’s victory over Kazuchika Okada. White’s win came courtesy of a low blow, which only helps his standing as a heel in Japan. White also beat former seven-time IWGP heavyweight champion Hiroshi Tanahashi, which is a remarkable way to open the tournament. Tama Tonga, who helped overthrow Kenny Omega and the Young Bucks’ leadership of Bullet Club, defeated Juice Robinson on the second night of the tourney, and Omega—who is the reigning IWGP champion—picked up a victory over rival Tetsuya Naito. Although the IWGP champion is part of the G1, the champ has not won the tournament since 2001, which makes sense, since the winner receives a world title shot. • Jake “The Snake” Roberts will be making an appearance at PCW Ultra’s “Sound the Alarm” show on July 27 in Wilmington, California. The following day, on July 28, PCW Ultra will hold a ring psychology seminar led by Roberts at the Santino Bros. Wrestling Academy in Bell Gardens, California. The opportunity to impart his wrestling wisdom is a highlight of every day for the 63-year-old Roberts, who coaches at the Snake Pit Pro Wrestling Academy in Las Vegas. Roberts fed off creativity, and he is frustrated by the lack of originality in matches on a weekly basis. “That’s what I don’t get about the young talent today,” said Roberts. “So many matches are the same. Don’t they get bored? It’s ridiculous what they waste, and they don’t even know they’re wasting it. I blame that on the new way of wrestling; if you come up now, you can be in the main event within a year. In my day, you had to learn. We had the territories that forced us to constantly grow and change. Roberts noted that matches are not defined by a certain number of moves, but rather by the effectiveness of the moves that are used. Roberts was also asked to discuss his brief 1986 feud with Hulk Hogan. The pair had an infamous moment while Hogan was seemingly at the peak of WWF fame in 1986 when Roberts DDT’d Hogan on an episode of The Snake Pit, but the storyline—and Roberts—fell victim to merchandise. “Vince had spent millions and millions of dollars to make this animal and have all this product ready to sell on Hogan,” said Roberts. “They weren’t going to waste money. So when the people started cheering me over Hogan, they said, ‘Oh hell no, we can’t have that.’ They turned me babyface and started beating me every night, and that didn’t matter to me because winning and losing don’t mean a damn thing. Roberts offered advice to anyone willing to listen, encouraging wrestlers to take a deeper look at the meaning of moves that have been cast aside. The WWE Hall of Famer also expressed gratitude to his fans, who he believes have stood by him even when he was not always giving them reasons to support him. • Coming attractions: Impact world champion Austin Aries spoke with Sports Illustrated in advance of this Sunday’s Slammiversary pay per view. The interview will run this Friday on SI.com, and Aries discussed his upcoming title defense against Moose, his recent attack on former NFL star DeAngelo Williams, and his regrets from his time in WWE. • “Something to Wrestle with Bruce Prichard” and co-host Conrad Thompson returns this Friday at noon ET with a new podcast, with a look at the WWF Invasion pay per view from July of 2001. Thompson sees a parallel from Austin’s booking in 2001 and the fans’ desire to see him work as a babyface despite being cast as a heel to 2018 with Roman Reigns, who is a babyface that a large amount of fans want to see as a heel. The episode also looks at the wrestling scene in 2001, including the business moves of Vince McMahon. Thompson’s WCW podcast, “83 Weeks with Eric Bischoff” will look next Monday at the 1996 Hog Wild pay per view which took place in front of 5,000 fans at the Sturgis Motorcycle Rally in Sturgis, South Dakota. The Hog Wild show still stands the test of time for its ending, when “Hollywood” Hulk Hogan and the New World Order spray painted the championship title.